Just like its other products, ThinSlim Foods has managed to cram low carb, low calorie, and low fat into their delicious bagels. Most people would say that it cannot be done: make a diet food that satisfies dieters of every sect. But that is exactly what ThinSlim Foods has done in its first offerings of 2012. We wrote in another article about their amazing brownies, muffins, and squares that offer incredibly low carb, low cal, and low fat nutritionals, and now we’re happy to announce ThinSlim Foods Low Carb Bagels. Diet food companies always make their “delicious low calorie bagel” a centerpiece of their breakfast menu. But rarely do those low calorie diet bagels deliver on taste. The ThinSlim Foods’ Low Carb Bagel is actually just 50 calories — 1/2 the calories of even the “skinniest” low calorie bagels, while still giving you an exceptional taste and texture. The bagel goes great on low carb as well: at just 8 net grams of carbs per bagel, it is definitely a carb bargain, considering how satisfying they are for breakfast — a perfect alternative to the monotony of eggs and bacon. And if you’re looking to cut fat, the ThinSlim Foods’ Low Carb Bagel has zero grams of fat! But what’s really reassuring is that the ThinSlim Foods’ low carb bagel isn’t some Frankenstein food that was concocted in a lab to do weird things to your metabolism. It is made in a regular bakery with no strange chemicals — just a medley of flours (organic wheat bran, natural wheat protein isolate, natural oat flour), purified water, sea salt, calcium proprionate (a light preservative), chicory roots, yeast (sorbitan monostearate), and dried onion. You’ll note that there are no “modified” ingredients on this list — and that it is a vegan list as well. 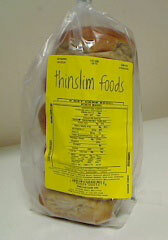 At present, ThinSlim is offering their Low Carb Bagels in a plain variety only. But knowing ThinSlim, they’ll eventually roll out some more flavors down the line. In the meantime, be sure to check these out. We think they will quickly become the leading low carb bagels on the market today. Thanks for reading our article! Linda’s Diet Delites carries ThinSlim Foods’ Low Carb Bagels! Click here to order today!